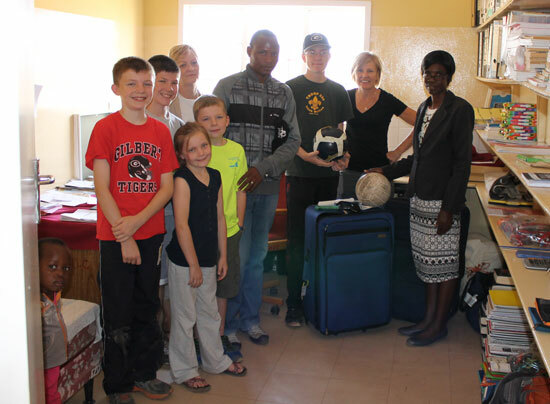 Our family traveled to South Africa, Botswana, and Zimbabwe last month. 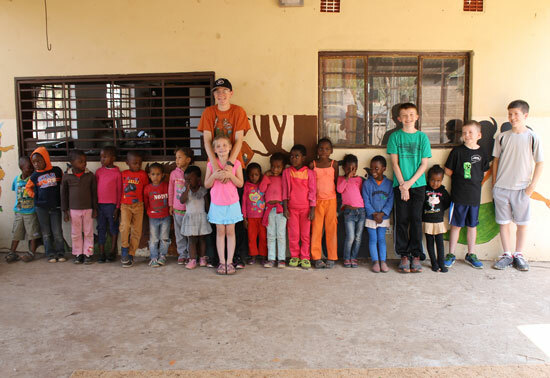 As part of our trip we wanted our children ages sixteen, fourteen, twelve, ten, and eight to participate in a service project. Our sixteen-year-old headed up a school supply collection drive as part of his Eagle Scout Project. Our other Scout children helped with the project as well. We ended up hauling thirteen checked bags (over 500 pounds!) through Chicago to Kasane via our flight and a rented trailer. Monetary donations covered the exact cost of the trailer we needed to transport all of the luggage. All the bags made it. Nothing was damaged or stolen. We spent our first full day in Kasane with Bana Ba Ditlou children. The morning was spent with the preschoolers and after lunch we hung out with the school age kids. We jumped rope, sang, played soccer and compared photos on our cell phones! It surely is a developing country. Because we had collected so many items, on Monday we stopped by Mabele Primary School. We dropped off dictionaries, school supplies, basketballs, and volley balls. We visited with the first graders and school staff. What a great feeling!